The Call for Papers now ends on 5th October! Due to popular demand, the Call for Papers deadline has now been extended! Don’t miss your final opportunity to shape the agenda for 2013. Is there a subject that you would like to present? A new development in the market that you are well placed to talk about? Then please do get in touch. 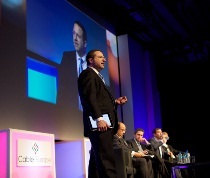 Cable Congress offers an extensive programme featuring top executives from the cable, technology, content and new media sectors. In 2012, the congress attracted over 850 participants from across the industry. High calibre delegates included 50% ranked Vice President and above and 19% coming from the C-Suite. If you would like to play a key role in defining the direction of the industry’s premier event, please contact us. We are taking papers submissions for another week – send title and a short abstract by filling in the online form and get your thoughts on the programme!